These days in all sorts of areas, from agriculture to oil, to mortgages and banking the buzzword is sustainability. When I examine my life style for sustainability I not only look at how I am growing today, I consider how my methods will work for me 20 years down the road. I can see where some of my practices are unsustainable. This thinking leads me to more closely examine the Forest Garden. For nearly 20 years I have been growing mostly annuals with just a few perennial fruits like cherries, mangos, pineapples and grapes. Annuals done the way I have done them are quite a bit of work, and pretty much the same work year after year whereas the fruit tree or perennial plant is put in, nurtured for a while and then I only have to do some mulching every few months (with the hay, pine flake and manure from the rabbit cages), and then my work is done except for harvesting and eating or putting by. Suddenly I see the brilliance of perennial food plants (I am getting tired of working this hard for my dinner.) I have added an avocado tree, bananas, pigeon peas, fig trees, almond trees, papaya, black berries, sugar cane more sweet potatoes (perennials where I live), rose apple, white sapote, more pineapples, pomegranate, and Yuca (aka Cassava). It is my intention to begin sowing my annuals in the mulch around the trees at the drip line or slightly beyond instead of in special beds just for annuals. This means that the beds now assigned to annuals only will also begin to get some perennial crops. I hope in this way to reduce my time spent planting and increase my harvesting. Annual crops that volunteer in my garden are a real bonus. They seem to come at the perfect time for their season, and they tend to do very well if I mostly ignore them. Some of the plants that volunteer in my garden year after year are Matts Wild Cherry Tomatoes, Bitter Melon, and Mustard Greens. I like to grow heirloom or open pollinated varieties of annuals for this reason. That way when a plant comes up on its own I know I can trust it to fruit as expected and with the good flavor I expect from my crops. Sweet Potatoes also come back every year though I count them as perennials. I have only had to plant them once in any one place. Once they are in an area they will come back there in the spring. I have also begun to use the wild plants that are growing in my woods for food having for so many years ignored them. There are wonderful muscadine grapes that grow wild here, and a couple of years ago I began harvesting those little purple grapes in July and August and although they are greatly picked over by wildlife I can come away with buckets enough to make a batch of jam and share a bucket with a friend. I have also been harvesting smilax or greenbriar, aka wild asparagus from my wooded areas. For years I didn’t know there was food on that thorny vine and I tried without success to eradicate it from my property. I am lucky to have so thoroughly failed. In the spring the tips from those vines are numerous and delicious. They rarely make it into the kitchen, I eat them and share them on the fly. Because of my more conventional hort. training early on I was concerned with crowding trees and plants and stunting them. Once I began to study about permaculture forest guilds, and I learned about mycorrhizae and the workings of root networks in the soil, I began to understand why forests work and how we can copy that in our own landscapes. There is a lot of misinformation to overwrite when it comes to gardening and agriculture. There are these long held truths and biases that are entirely wrong, and they are so prevalent and so familiar that it is easy for them to creep into our practices unless we are diligent about regularly examining what we are doing with the garden and why. What this means to us in the urban or suburban setting is that we can grow much more food in much less space than we have been lead to believe in the past. Now go outside and start the food forest. The best day to plant a tree was 10 years ago. The next best day is today. I LOVE when I get volunteers! Since I live close to you, I get many of the same things, sweet potatoes, and cherry tomatoes, as well as several varieties of basil, mammoth sunflowers, and the paper-husked sun berries. I’ve also had surprise additions of a couple avocado trees and a papaya tree grow out of my compost. I’m hoping this year my Malabar spinach will join the group of ever-present food crops in my yard. And I’m also happy to see you too like smilax! I’m now wishing I had MORE of it growing around my property! Green Deane from eattheweeds,com showed this to me on a edible plant walkabout at Dreher Park. in Palm Beach county. The longer I continue down my path, the more folks I see doing, learning, and enjoying the same things…call it a version of convergent personal evolution! Brilliant. You keep coming up with great ideas. I hope people are listening and taking action. It’s called solid long term thinking. Thanks. I am always amazed that the cool possibilities you write about!! Thanks for your comments, Sara, Guitar Players Center, FloridaHillbilly, and Barbie. Thanks for reading. I had malabar spinach volunteer on me after my first year growing it, but not after the second.. I also get Amaranth volunteers in the strangest places, and PoHa berries have come back for me too this year. I am real glad to find another Florida Green Dean fan. I didn’t know he came to Dreher Park. How lucky for Palm Beach County! Convergent personal evolution, I like the term. Let’s hope it becomes a social revolution. I am worried about how many local people I meet who don’t bother to produce a single useful thing at home. Once again great, honest information. It just so happens to be perfectly timely for me! Two weeks ago I added avocado, figs, and macadamia trees to my collection of young perennial fruit trees. I am looking a cherry varieties. What kind did you put in? Thanks for your comment Angela. I am glad to hear about the perennials you are putting in at your garden. I would like to put in a macadamia nut tree too.. I really like my Barbados Cherry. I have also eaten the Grumichama or Brazilian Cherry and I know it grows well here, though between the two I prefer the flavor of Barbados Cherry. 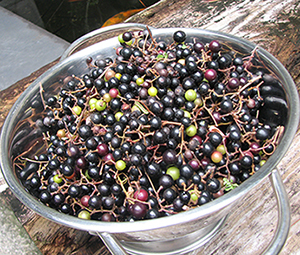 We also have Surinam cherries growing around the property and I mostly leave them for the wildlife on account of the flavor. My neighbor gets a Surinam Cherry that is much darker than the kind I have, and it is tastier. I was just at Trees N More in Stuart picking up a couple of banana plant donations for Heathcote, and I bought a Lychee tree for my own land. Because of my visit there I put Atemoya and Sapodilla on my wish list. 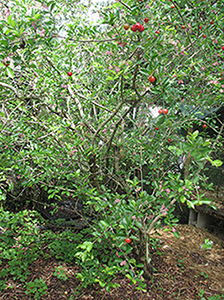 They also have Barbados and Grumichama Cherry plants there as well as many other Florida appropriate fruiting trees.